As a percussion educator, I often hear a particular question - "What kind of sticks should I buy?" With nearly a dozen brands and literally hundreds of models, the humble drumstick has evolved to fit every possible hand size and musical style imaginable. Size: Model codes (5A, 7A, 2B etc) refer to the taper of the shoulder as it relates to the overall circumference and length of the shaft. The larger the number, the smaller the circumference (a 7 is smaller than a 5). The letter is an old abbreviation system that designates the type of music for which the stick was originally intended. “S” refers to street, as the larger stick circumference was popular amongst marching/parade ensembles that performed outside. “B” is the abbreviation for band, and the medium sized circumference was useful in concert bands for rudimental work and dynamic control. “A” is the code for orchestra, and became popular with drummers looking to control their sound on a drum kit in a jazz band (Ludwig came up with the idea of using “A” instead of “O” for some reason, and it has been the industry standard ever since). Straightness: A pair of sticks that is straight and true will not wobble when rolled across a level surface. Weight: Most companies match the two sticks in a pair by weight. Make sure the sticks you are using are approximately the same mass and keep them sorted in their sleeves. Grain: The grain of a drumstick should run parallel to the length of the stick. Again, quality control is usually good at keeping the manufacturing process uniform, but defects are not uncommon. Hickory and oak tend to have a fairly pronounced grain, however, maple grain can be difficult to see. Any stick with an angled grain will break and should be discarded. Pitch: Wood is an incredibly resonant material, and a large part of the "feel" in a pair of sticks is determined by the vibrations traveling through the implement. The weight and cut of a wooden dowel will dictate the fundamental pitch of the resulting stick. To find the pitch, pinch the stick at the fulcrum (2/3 down the stick from the tip) and tap it with your index finger while holding it next to your ear. Two sticks with the same pitch will generally be equal in weight. For many players, stick choice often comes down to brand loyalty. Once you've considered size and other factors, it may just be a matter of choosing which brand you like best. Here's a little info about some of the bigger stick makers. Legendary percussionist, Everett "Vic" Firth bills his company as the largest manufacturer of drumsticks and mallets. This brand offers the standard 5A, 7A, and 2B sizes as well as over a hundred signature series drumsticks. Vic Firth was the first company to offer signature lines of drumsticks, and debuted the "Steve Gadd" SSG model in 1982. With its sleek black finish and light barrel tip, the SSG has become a mainstay for session drummers. We recommend the Maple 5A for rock/pop, and Classic 7A for lighter applications. The SD1 General is also an essential tool for rudimental work and practice-pad jamming. Founded in 1957 by a drumshop owner in Houston TX, Pro Mark is now owned and run by D'Addario & Co. The company was the first to successfully market sustainable Japanese oak drumsticks, and the "Shira Kashi Oak" series remains popular with heavy-hitters. We recommend the Shira Kashi 2B Nylon Tip for "those about to rock". For subtler situations, the Hickory 7A offers a light shaft and barrel tip that provides rebound without reducing cymbal sound. While not technically a stick, the Hot Rod "dowel bundle rod" model is also an essential tool for low-volume acoustic settings. Another company that was created in the basement of a drumshop, Vater established itself as a boutique designer for the likes of drummers such as Buddy Rich in the early '50's. The company labels its hickory 5As and 7As as "Los Angeles" and "Manhattan" with respect to these regional musical hubs. For both live and studio work, the Los Angeles 5A is well balanced with a heavier tip for fast attack on the drums. The Manhattan 7A is popular among be-bop musicians and features a longer shaft with a round tip. Vater is also well known for its Sugar Maple series which offers a lightweight alternative to hickory without sacrificing stick size. Until Regal Tip was founded by Joe Calato in 1958, the problem of disintegrating drumstick tips was a drain on many an aspiring drummers' wallet. According to legend, Joe solved this problem by chiseling a plastic screwdriver handle into the shape of a bead and gluing it to the end of his spent drumstick. Primarily made of nylon, synthetic-tips are available as an alternative to natural wood in most makes and models of drumsticks. While other companies offer nylon tip options, Joe claims that his "E-Tip" is "durable, yet offers the warmer sound of wood on the cymbals". We recommend the 5A E-Tip for a variety of musical styles. Regal Tip also manufactures a wide variety of wire brush models including the Classic Telescoping Brush, an industry standard. Primarily known as a keyboard mallet manufacturer, for the past decade Innovative Percussion has made a name for itself designing high quality drumset sticks. Featuring an extensive roster of both touring and regional artist signature series sticks, IP also promotes its Vintage and Legacy series stick choices designed for specifically for jazz. We recommend the IP-7A hickory stick with an acorn tip for jazz cymbal work. Synthetic tips are one option in the drumstick world, but what about something for the truly explosive drummer? Ahead's synthetic drumsticks feature an aluminum core wrapped in a polyurethane jacket and a nylon tip. Available in standard diameters/lengths, Ahead also offers a variety of signature models including three different Lars Ulrich custom designs. For drummers concerned about stress related injury, we recommend the Hybrid Series with its patented Vibration Reduction System. At over $30 a pair, these sticks are an investment, however many of the models can be fitted with replacement tips and the company offers a recycling program for broken sticks. Well, there you have it. 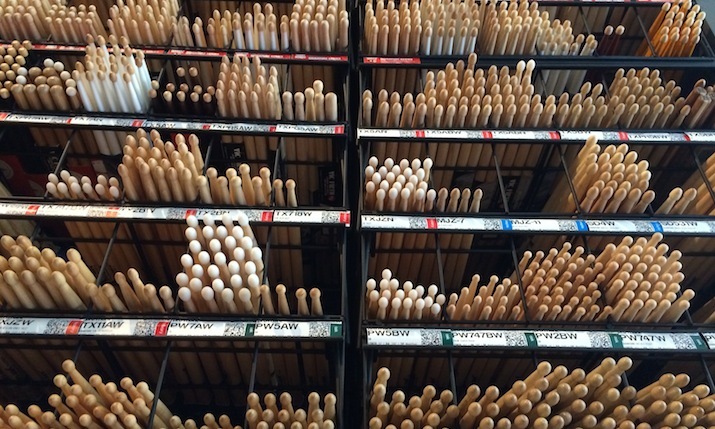 Choosing a pair of drumsticks from of the hundreds of models available can be a daunting task. However, the multitude of options available insures that every drummer can experiment with a nearly limitless list of stick designs. Hopefully this list will provide you with the information necessary to find the pair that’s right for you.